Manchester International School gives major importance to clear communication within the school and to a positive partnership with parents. Goal- what is the policy intended to achieve? Email to support desk: Parents are most welcome to communicate by sending a mail to support desk at [email protected], the school will always try to acknowledge letters and emails received from parents and guardians within two working days. Members of staff will try to respond to the most pressing concerns of parents and guardians as quickly as possible. It is our intention to try to respond to any letter or e-mail as soon as we can and within 7 working days. Phone call (in case of emergency to school reception only on 0422-6656555 - 10 lines, and hand phone 9244555557): In emergencies or at other times when it is unavoidable, reception staff will help parents and guardians by taking messages via phone. Unfortunately, due to the busy nature of the day and volume of calls there can be no guarantee of passing on messages though we will endeavour to see this happen. Website: The school seeks to put as much up-to-date information as possible on its website. Most general information that parents and guardians would seek can be readily found by logging on at www.manchesters.in . Newsletter: The school will also communicate via newsletters which are produced online and as a hard copy which are distributed directly to the students. Parents and guardians are encouraged to read the newsletter which will be sent biweekly and UOI newsletter will be sent once in six weeks. Circulars: Some Information will be sent via circulars (hard copies) with the students, parents are required to ask the students or check their diaries for such details. 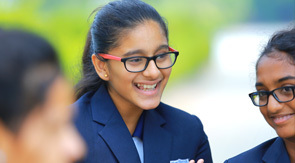 "MIS is one of the best international schools in India. The students can develop healthy habits only in the school. The syllabus is excellent. The teachers are well qualified and trained. When compared to other schools in Tamilnadu, the coaching is very nice. The school boasts of beautiful building with huge lusgreen gardens and spacious playgrounds. MIS offers excellent coaching in arts and crafts specialties, shuttle and soccer. Food and health care is high on the agenda of the school administration and my son just adores it."